A nickel-free sterling silver band hosts a 14K rose gold saucer containing a delicate white pearl that is breathtaking and luxurious. Pearl measures 4mm in size. Band measures 3mm wide. View More Gold and Silver Jewelry. 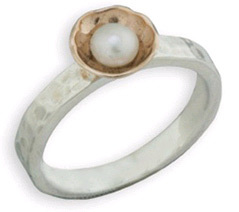 We guarantee our Handmade Pearl Ring in 14K Rose Gold and Sterling Silver to be high quality, authentic jewelry, as described above.